The troubling association — in fact, overassociation — of blacks with criminality directly affects the way we think about both crime and blacks as a whole. A damning report released by the Sentencing Project last week lays bare the bias and the interconnecting systemic structures that reinforce it and disproportionately affect African-Americans. This is the kind of report that one really wants to publish in its totality, for its conclusion is such a powerful condemnation of the perversity of racial oppression. Fortunately, the Sentencing Project begins its report with an Executive Summary, so we are able to preview its contents and get a fair representation of its findings, as well as recognize the main thrust(s) of the analysts and their priorities. Don't expect objectivity. Wikipedia describes the Sentencing Project as a 501(c)3 organization which "works for a fair and effective U.S. criminal justice system by promoting reforms in sentencing policy, addressing unjust racial disparities and practices, and advocating for alternatives to incarceration." Their slant is evident. Still, a few valid observations are made in the report and- more sparingly in the Executive Summary. We read "Whites who more strongly associate crime with racial minorities are more supportive of punitive policies," a crucial point because the perception of voters influences the actions of policymakers. If voters are to support such measures as capital punishment and mandatory sentencing, they ought to do so because they benefit the nation, their community, or themselves, rather than from their view of blacks as prone to criminality. Whatever the validity of that perception, it evidently skews for unacceptable reasons support for punitive measures . By increasing the scale of criminal sanctions and disproportionately directing penalties toward people of color, racial perceptions of crime have been counterproductive for public safety. Racial minorities’ perceptions of unfairness in the criminal justice system have dampened cooperation with police work and impeded criminal trials. This is not some overly technical objection. It is likely that the perception of blacks toward the criminal justice system is somewhat different than that of Hispanics, and substantially different than that of, say, Asian-Americans. Moreover, whatever alienation there may be of the latter group toward the justice system would not have an identical genesis. Yet, this misleading and arguably racially biased terminology pops up elsewhere. "White Americans," the Sentencing Project has discovered, "are more punitive than people of color." This might actually have meaning, if we knew whether the reference is to blacks exclusively. Nonetheless, this is hardly a surprising finding given that, as the organization notes, "White Americans overestimate the proportion of crime committed by people of color, and associate people of color with criminality." It's curious, though, that while pointing out "respondents in a 2010 survey overestimated the actual share of burglaries, illegal drug sales, and juvenile crime committed by African Americans by 20-30%," the report neglects to reveal how many of those respondents themselves were black. More significantly, the Executive Summary uses the figure of 20-30%. The meaning of the figures is clarified when we later read "The researchers found that the respondents overestimated actual black participation in these crimes – measured by arrests – by approximately 20 to 30 percent (between 6.6 to 9.5 percentage points)." Americans are off in their estimation by 6.6 to 9.4 percentage points: off with their heads! Disparities in police stops, in prosecutorial charging, and in bail and sentencing decisions reveal that implicit racial bias has penetrated all corners of the criminal justice system. Moreover,polices that are race-neutral on their surface- such as "hot spot"policing and certain risk assessment instruments- have targeted low-income people of color for heightened surveillance and punishment. whites are far less likely than blacks and Hispanics to be victims of crime. In 2008, African Americans were 78% more likely than whites to experience household burglary, 133% more likely to experience motor vehicle theft, and experienced other types of theft at about the same rate.38 Hispanics were 46% more likely than non-Hispanics to be victims of property crimes. Black Americans are also exposed to violent crime, especially serious violent crime, at much higher rates than whites and Hispanics. The report aims to start correcting, in the words of a sympathetic Blow, "The troubling association — in fact, overassociation — of blacks with criminality (which) directly affects the way we think about both crime and blacks as a whole." But there is an association- not a causation, but an association- of blacks with crime, leading to a somewhat accurate though way over-exaggerated perception among whites. The numbers are complex and not directly comparable, yet statistically significant. 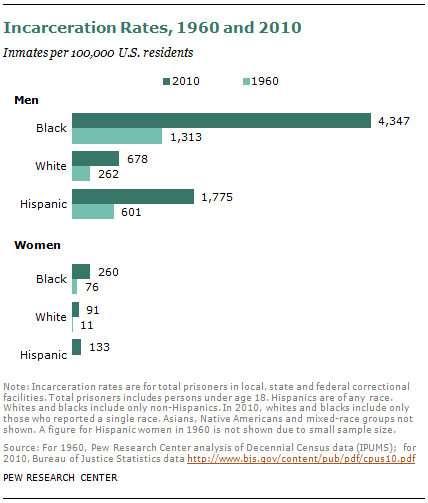 According to the FBI's Uniform Crime Report of 2012 , 69.1% of offenders charged were white and 28.01% were black. (There other categories were American Indian or Alaska Native and Asian or Pacific Islander. I don't know how Hispanics were treated- or whether they were considered "people of color.") Given that blacks comprised approximately 13.2% of the population that year but were 29.01% of the population charged, there is something going on. But the fundamental flaw in both he Sentencing Project's report and its favorable treatment by Charles Blow is failure to understand that crime in the USA is treated primarily on the state, not federal, level. To be sure, there are national offenses, law enforcement personnel, arrests, and punishment- but there are far more of all on the state level. There are, further, glaring differences among states. Consider that in 2010, Tennessee had 6.4 crimes per 1,000 residents; Massachusetts, 4.06. In 2008, Tennesseans had given Barack Obama 41.8% of their vote in the presidential election; Massachusetts, 62.0%. Why, some people have speculated even that the perception of blacks is different in Tennessee than in Massachusetts! But when it comes to crime, we're expected to assume it's all the same: in Tennessee and in Massachusetts, in Arkansas and in Rhode Island, in Utah and in Michigan. There is a racial disparity, one that demands analysis, in the American criminal justice system. However, it is exceeded by inter-state disparity in our federal system. Facts, we know, have a liberal bias. Let's leave the over-generalization and simplistic accusations to conservatives- they're much better at it, anyway.